We were invited to a sausage party at the Cinque Ports restaurant in Margate. 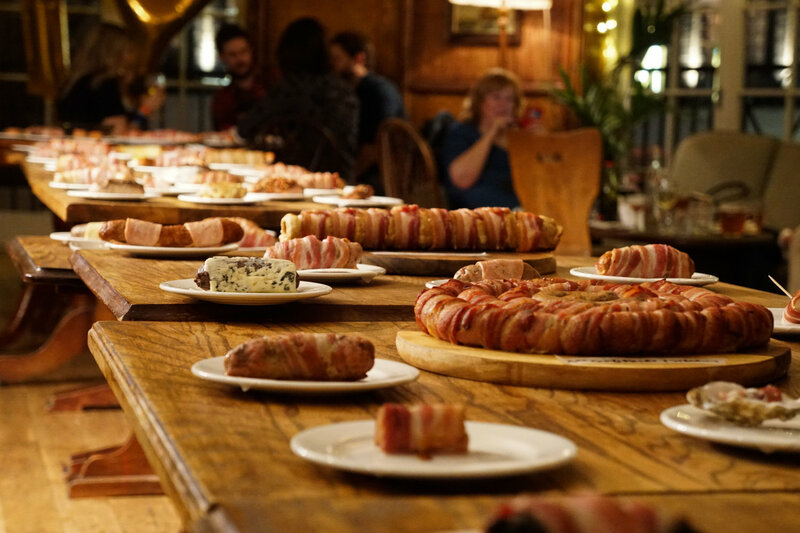 With 100 different pigs in blankets to try on the evening, we were pretty excited about going along. The restaurant is just in front of Dreamland on the seafront in Margate. As we walked along the blustery route from the train station, the pigs in blankets were calling out to us through the dark cold night, The Cinque Ports emanating a radiant glow as we approach. Wrapped up in coats and scarves, our cheeks rosy from the cold air, we head inside for an evening of meat and merriment. There was a really nice laid back atmosphere and a DJ playing great music throughout the night. The twinkling fairy lights and convivial mood made for a real Christmassy occasion. 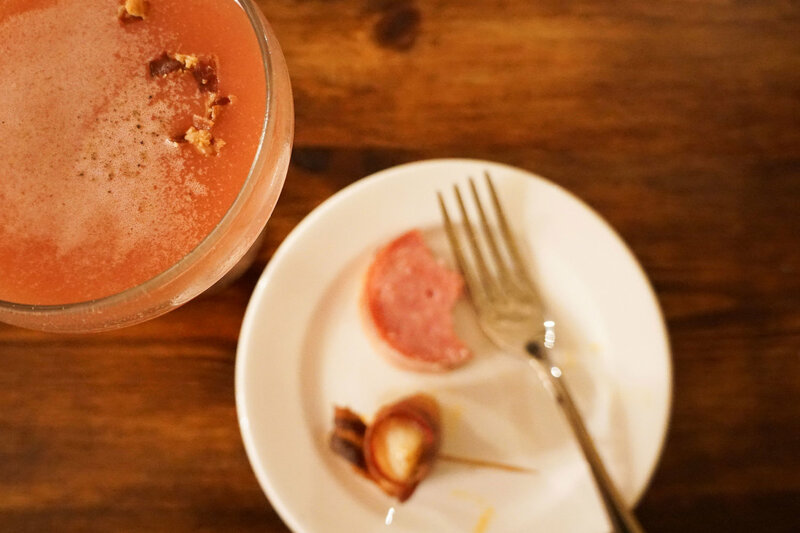 We enjoyed a ham daiquiri on arrival, a delicious fruity cocktail added spiced ham stock and sprinkled with candied ham. We got a preview of what was to come from the display of plates stretched out in the centre of the room. 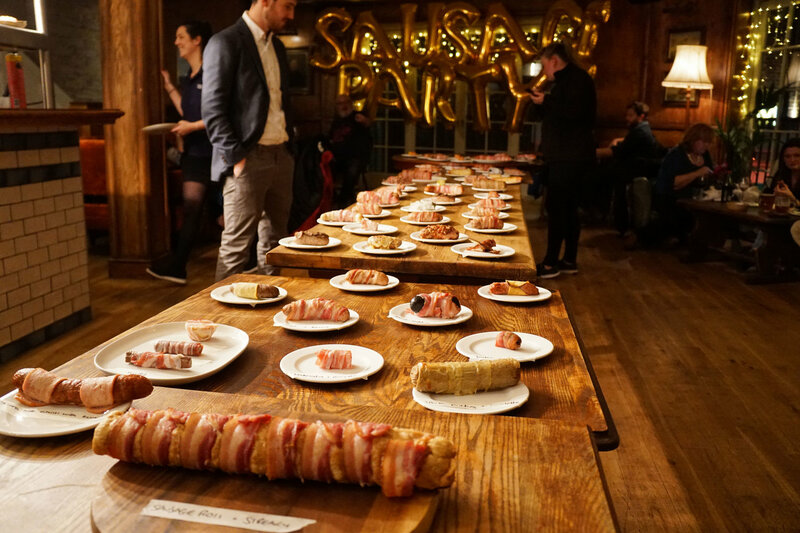 Each dish was a different type of pigs in blankets, stretching across several long tables. It was a vegans nightmare, but our dream. Plates laden with samples of ingenious and creative combinations were offered around the room. At times it was like a sausage conveyer belt and we had to stack them up on our plate to get to them all. We slowly filled up on meat and festivity. Some of our favourites included: Beer battered pigs in blankets, sausage rolls in blankets, bacon wrapped scallops, parsnips in blankets, chicken sausage & chilli jam, and haggis in blankets. There were a few veggie options floating around, and they tasted almost as good as the real thing. But overwhelmingly, this was a night for the carnivores. 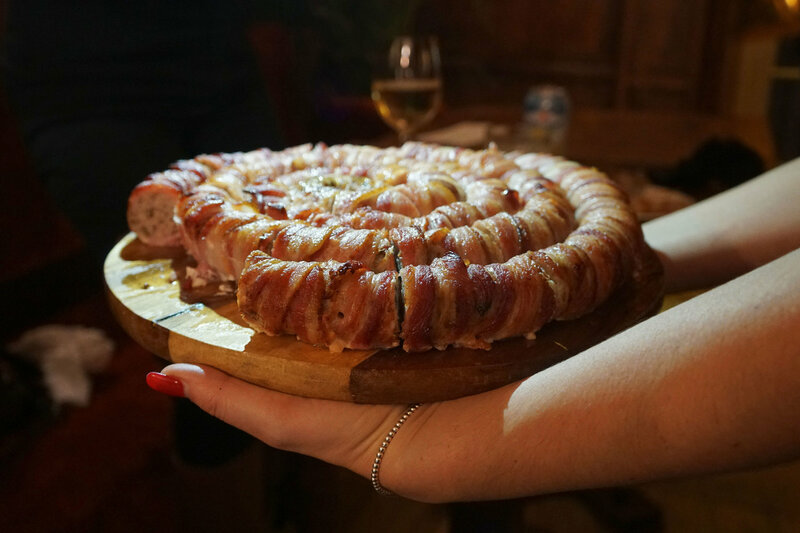 The show stopper was the sausage wreaths; a 6ft Cumberland sausage wrapped in bacon, it was an incredible sight to behold. As you can imagine, sampling 100 pigs in blankets is thirsty work. Luckily Chapel Down wines were there to provide samples of their drinks. We also ended up making several trips to the bar for water. The evening came to a close with an offering of bacon wrapped mince pies and Twix in blankets. Both delicious, the Twix had melted and the combination of chocolate and bacon was a revelation to us. With the steady stream of food, we didn’t realise how much food we’d actually eaten. Until it became pretty clear we’d eaten a whole lot. It was a great evening to get us into the festive spirit and to start loosening the belt in preparation for the feasts ahead. 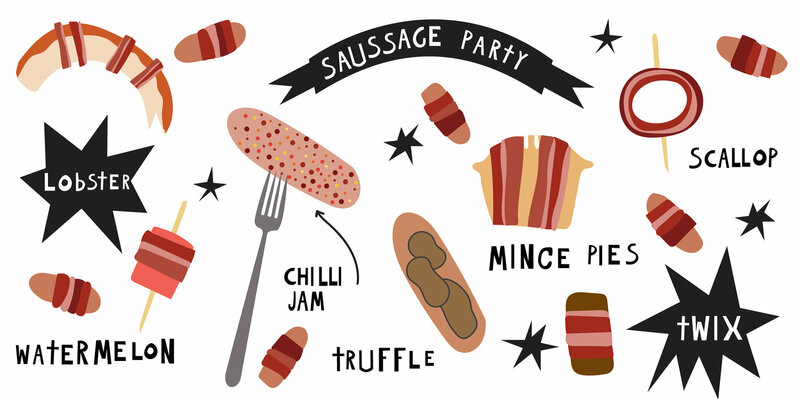 We woke up the next morning with a meat hangover, we might be giving the pigs in blankets a rest until the 25th! If you’d like to get into the swing of things and try some delicious food, the Christmas menu is here. Featuring a “Santa's whopper” burger, which is like a whole Christmas dinner in a bun. Or choose from the festive feasting menu for dishes like beetroot gravadlax and brill bourguignon. The pigs in blankets are available from the restaurant, with a different version to try each day. More info see their website.